If your name is BARTLETT or if you descend from a BARTLETT you should find this site interesting and informative. We are the descendants of Robert Bartlett who came to Plymouth Colony, Massachusetts on the Anne in 1623. He married fellow passenger Mary Warren, daughter of Richard Warren who came to Plymouth Colony in 1620 aboard the Mayflower. In this site you will find information about Robert Bartlett, his descendants, and our Society. We hope you will consider becoming a member and help us to preserve our Bartlett heritage. The Society was founded August 13, 1908 and incorporated December 11, 1909. Its purpose is to investigate and preserve information pertaining to the said Robert Bartlett, who came from England to Plymouth Colony in 1623, and his descendants. Read the Charter and By-laws HERE. The Society meets annually, usually in the Plymouth, Massachusetts area and usually the last Saturday in July. The Society publishes two newsletters annually. Robert Bartlett was not the only Bartlett in New England. He was, however, the first. 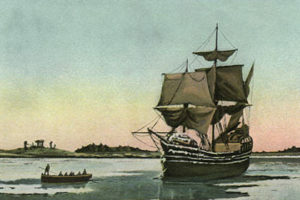 There have been many attempts to connect Robert to some of the other Bartlett families in New England or in Old England. So far unsuccessfully. There is a common belief that all the Bartletts in England and America descend from the hereditary Lords of Stopham, County of Sussex, England. There is often confusion over the many different Bartlett immigrants and their descendants. The Society has many members who have joined and later found that they descend from one of the other immigrants. 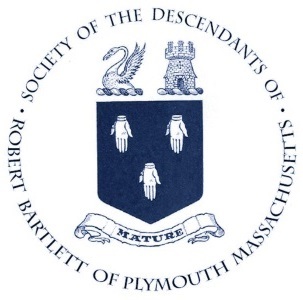 The Society always welcomes these Bartletts and over the years has been identified as The Bartlett Society, rather than the Descendants of Robert Bartlett of Plymouth, Massachusetts, it’s formal title. Y-DNA testing is bringing some clarification and identity to these many Bartlett lines. In recent years the Society began to collect information on all Bartletts and their descendants. It is our hope that we can clear up any confusion over our Bartlett ancestors and one day we may learn that all of these Bartletts descend from the same root lineage. The Society is anxious to collect all data concerning any Bartlett or their descendants. It is our hope to become the clearing house for Bartlett information.